ABOVE: Part of Foundation 51 return of receipts during 2013/14 submitted by Graeme Lewis. 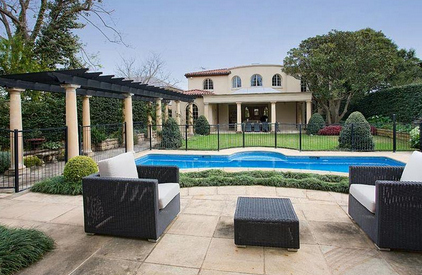 AT RIGHT: Vaucluse home given as address by one donor in 2012/13. The drawn-out Foundation 51 Pty Ltd “slush fund” cloak-and-dagger saga may have been a storm in a teacup: This raises questions about why a government regulator, the Electoral Commission, and the Country Liberal Party, which is governing the Territory, would let things get so out of hand. It seems F51 was a paper tiger all along: The hundreds of thousands of dollars it raised wasn’t cash, but apparently mostly in-kind services. “Apparently” because the Electoral Commission (EC) doesn’t know either. Nor is it clear what the in-kind contributions were all about: They were variously labelled by Foundation 51 (F51) as “consultancy” or “seminar” or “consultant fee”. For example, BJAAT Pty Ltd is listed by F51 as having contributed $55,000 in 2013-14 as well as in 2012/13, both labelled “consultancy”. While on the one hand the EC demands declaration of contributions, it has no idea what these contributions are. This appears to be falling well short of the Electoral Act which requires “gifts-in-kind to be appropriately valued … as evidenced by arm’s length quotations”. But all this will change, says an EC spokesman: “We’re employing a company to go back to those individuals to ensure that there are receipts, to follow the trail of transactions. F51, registered in 2009 and de-registered on May 13 this year, amidst a police investigation, had Graeme Lewis (pictured) as its director, secretary and sole shareholder. It is not clear why F51 has emerged as an “Associated Entity” which has the same reporting obligations as a political party. Why is F51 an Associated Entity, we asked the EC. Because Mr Lewis provided Associated Entity Annual Returns (this year, two of them well after the deadline). Did the EC ask him to lodge these Associated Entity Annual Returns? What is an Associated Entity? “It is an entity controlled by or operated wholly or significantly for the benefit of one or more political parties (control is the power to govern the financial and operating policies to obtain benefits),” says the EC handbook. Former CLP vice-president Daniel Davis, who moved to executive positions while this kerfuffle was well underway, says the party never asked F51 to be an Associated Entity. However, as Mr Lewis went ahead and filed returns naming the CLP as beneficiaries of F51 largesse (an “estimated” $20,000 in 2012/13 and $200,000 “in kind advice” in 2011/12), the party felt compelled to declare these as campaign donations. It received no cash from F51, says Mr Davis. Mr Lewis was regarded as the grey eminence of the CLP. He was still on the management committee of the party in April last year. He no longer is. He apparently treated lightly the police investigations, which ended with a decision by the Public Prosecutor not to prosecute. In fact the Act provides for a fine of up to $30,600 or imprisonment for 12 months for natural persons, or a fine of $153,000 for bodies corporate. The affair has done plenty of damage to the CLP, and caused a lot of worry, according to a letter leaked to us. Former CLP president Braedon Earley wrote to the party’s president, Ross Connolly, in April last year about an un-named “CLP Executive” who “could find himself in a bit of hot water”. Mr Earley, who is not the source of this leak, and who has since founded the 1 Territory Party, means Foundation 51 when he refers to “said Company” in his email which was also sent to the party’s two vice-presidents. Mr Earley was anxious about the party finances in general, and in particular its spending for the Blain by-election triggered by the resignation of former Chief Minister Terry Mills, who had been toppled by Adam Giles. The by-election was on April 12, 2014. A “CLP Executive said that he had still not seen the books, this was after being in the job for six months,” wrote Mr Earley. “Spending at the Blain By-election was not discussed in its entirety with him nor was it authorised by him, in fact he went on to say that he had pieces of paper shoved in front of him with amounts on them that indicated sums required. “I asked if said Company had put any finances into the Blain by-election either directly or indirectly, he said ‘I don’t know’. I asked if said Company could be linked back to the CLP, he said he didn’t know. “I suggested that as [an] executive of a political party he didn’t know much and suggested that he step up to the mark and find out more if not for the party for himself and that he make contact with the president and get on top of the situation. “He asked why and I suggested to him that hypothetically if it could be proven that said Company was a slush fund used by another CLP Executive to finance elections, candidates, backhands and CLP campaigning activities then he could find himself in a bit of hot water, particularly if said Company could be linked back to the Country Liberal Party,” Mr Earley wrote to Mr Connolly. The Foundation 51 issues have been canvassed in other media and in the Legislative Assembly for more than a year. Suffice here an outline of some salient points. The Country Liberal Party’s Deputy Treasurer Eli Melky, an Alice Springs identity and an elected member of the town council, demanded answers about Foundation 51. He did so in March last year, when he also questioned why the CLP’s accounts had not been audited for five years. In an email to the CLP president at the time, Ross Connolly, Mr Melky stated that in his position, which he had held for six month by then, he needed to be fully acquainted with the party’s finances. And that would include those of Foundation 51 which he clearly considered as having a connection with the CLP. He wondered whether all requirements of the Australian and NT Electoral Commissions were being met. Mr Melky did not get very far with his curiosity about Foundation 51. He was copied into an email to Mr Connolly from Mr Lewis. Mr Lewis claimed that the discussion triggered by Mr Melky “may well breach … the wall that must rightly exist between the Party and the Foundation”. At the same time Mr Lewis made no secret of the financial benefit provided to the CLP by Foundation 51, and deplored the public attention the issues were getting. He wrote: “The wide canvassing by Mr Melky’s widely circulated letter, of the existence of Foundation 51, and its now-claimed relationship with the party, draws the whole matter into wide focus. “One hopes that garage sales will be able to replace the Foundation in providing adequate resources for future profile building. “I have made the Chief Minister [Adam Giles] aware of this probability, much to his concern. “He and I have on many occasions discussed the matter of the Foundation, and he is well disposed to having the Foundation continue its activity, with the wall between the entities currently, fixed in place,” wrote Mr Lewis. “[But] the horse may well have bolted already, and the more public discussion that takes place, the more I personally with others, are vulnerable, and accountable to the many contributors who support the Foundation regularly. “I have to question how many garage sales and golf days will be needed to produce the many millions of dollars that will be required before the end of the year 2016. A CLP source asking not to be named said in that same letter Mr Earley accuses the party of discussing the expulsion of Eli Melky, but says that accusation was baseless. “At the time it had been rumoured that Mr Melky had been talking to Bob Katter and Clive Palmer about setting up in the NT. “I am not heartened by the release of this old communique. “Whoever has released it must have their reasons. Nothing positive can be taken form this information, apart from the knowledge of how not to run a political party and what level of intelligence / commitment / experience is required by those candidates to gain pre-selection in the future (bearing in mind what they became once elected). “1 Territory will gain registration with the Northern Territory Electoral Commission within the next couple of weeks. “Territorians will have a choice at the next election between two well established parties whose masters live on the eastern seaboard, who are both pro fracking, who have both approved fracking exploration licenses in the Territory, who both wanted / have sold off public assets / businesses and who have successively cut funds to Non-government organisations (impacting on youth and criminal activities) and the newly formed 1 Territory party which is anti-fracking. Foundation 51 was NEVER a slush fund, nor was there ever any cloak and dagger stuff. The Company was a legitimate business entity which provided services to its clients based on commercial reality, and paying clients willingly dealt with the Company over a long period. The business model of the Company has been smashed with intent by the media and their connivance with Earley, who clearly set out to destroy both Terry Mills and myself. The company is now defunct. Clients of the Company certainly paid cash to the Company, so that statement about “wasn’t cash” is 100% wrong. The in-kind services to the CLP, to which you refer, were certainly not cash, but were services, in the form of advice that I Graeme Lewis provided to the CLP by virtue of me being on various committees of the CLP, as you have described. You have asked about clients of the Company, naming one in your email. These were clients requiring advice and services, and were listed in returns required by the Electoral Commission. The Australian Electoral Commission does not require details of such clients if they were not associated with politics, but the NT mob do. I had no intention of offending the law according to NTEC, so all the names went in – political or not. Mostly not. The “spokesman” for NTEC has made statements, and if that happens, I will co-operate absolutely. There is nothing that can come out of this. I come now to “Why is F51 an Associated Entity?” It is simply that the definition hangs on the words “significantly for the benefit of …” My legal advice was that if I was on a CLP committee as well as being a Director of F51, I would very likely be caught as “significant,” so I simply lodged the forms. Late – but nothing to hide. I object to your statement that I “treated lightly the police investigations.” That is quite untrue. Walsh invented the phrase “slap on the wrist,” to suit his purpose – I never said any such thing. The quote about the $200 fine is accurate but way out of context. I have no respect whatsoever for Earley, Melke or even Daniel Davis. They all had their agenda, which was to destroy Mills – and me. They achieved both, with statements all taken out of context with deliberate intent. You write about the Blain election. Yes – I gave plenty of advice about that campaign, and once again, reported on that advice being an in- kind donation. As an accountant, I believe the word means “lots,” certainly more than 50%, but the lawyers said it could be as little as just a few words of advice. There is no doubt I gave plenty of advice, so I owned up. The Territory will never move forward until it cuts long-festering cancers out of its system. The DPP has said it won’t proceed with a prosecution due to it “not being in public interest”. Surely that must be code for “Territory Governance as we know it could collapse in upon itself if we took this further”? And our Chief Minister talks about Statehood. What a disgrace! Raking over “old cold coals” eh Erwin! Well, I thank you for your diligent insistence. That a bloody big bonfire has blazed away for a lot of years and many of the old boys’ club who warmed their bums now have burned fingers.Cold Case’ mysteries have always been solved by sifting through the ashes. Keep at them, Ed.